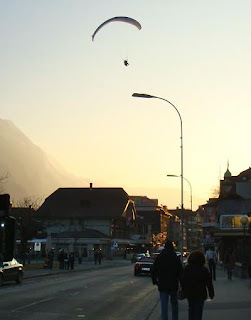 Gondola lifts, a revolving restaurant, Bond memorabilia, and a disappointing small town. After my unexpectedly intense ski day, I needed a calmer day to recover. But I wasn't going to stay in bed at the hostel all day, and I still had the second day of my 2-day train/ski-lift pass to use. So naturally, I returned to the mountains! This day, I had a mantra: "Take it easy." The Eagles song provided a soundtrack to my day, as I traveled up and down gondolas and vowed to not let the sight of all those skiers drive me crazy. I left the hostel after another unexciting breakfast of stale bread and cereal. The day was misty and sunny, a relaxed day between the mountains. I made my way across town again to the Interlaken Ost (east) train station. The day was surprisingly mild for mid-February. There were skiers and snowboarders on the train with me to Lauterbrunnen (it's actually a single train that splits into two halves, one half going to Grindelwald, where I was yesterday, and the other half continuing to Lauterbrunnen). From there I transferred to a bus to take me to Stechelberg a small town at the base of a thousand-foot near-vertical wall of a mountain. 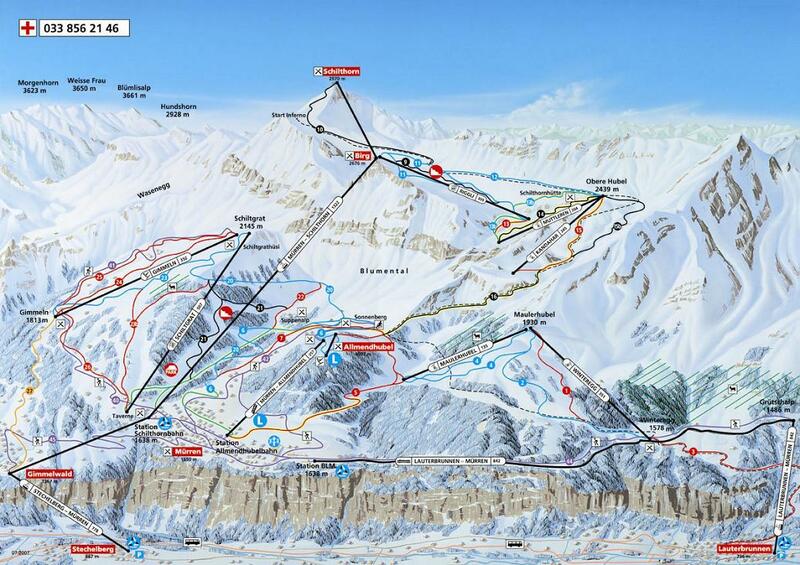 My itinerary took me up and down cable cars / gondolas / ski lifts (whatever you call them!) for the whole day. And it was fun - cramming into the cars with a few dozen skiers and snowboarders. The cars were mostly smooth, rocked back and forth a little as they passed a supporting pole, but when that happened everyone (especially the kids) would just say "whoooooaaaa" and laugh afterwards. 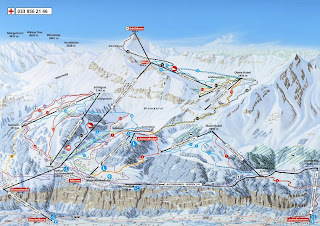 So from Stechelberg, the gondola ascended to Mürren (via Gimmelwald - which I would return to later in the day), where I transferred to another lift that continued up the side of the mountain. 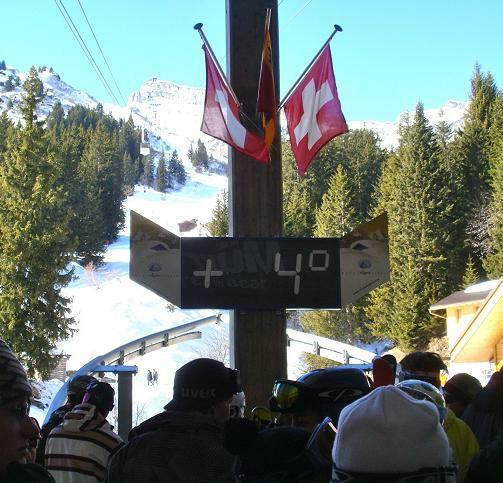 Since there was a lift coming every 15 minutes or so (thanks to Swiss-German efficiency! 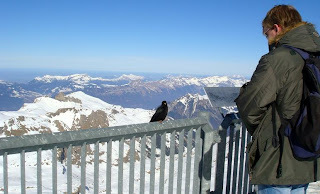 ), I had a little time to get out at the stops along the way and take in the increasingly breathtaking views. 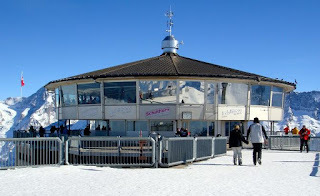 Soon I arrived at the final station, the peak of the Schilthorn, famous for the revolving restaurant at its peak, Piz Gloria, as well as the James Bond movie that was filmed there, On Her Majesty's Secret Service. 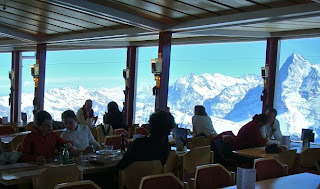 I followed the footsteps of George Lazenby as I strolled out of the gondola and into the mountaintop building. I walked up to the revolving restaurant. 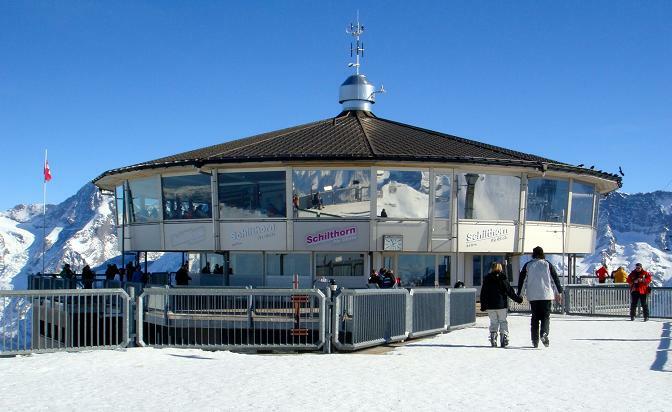 It was just like any other revolving restaurant, nothing too unconventional and somewhat dated-feeling, like a cultural-historic monument from 1972. Still, having the wondrous dream-like scenery of the Alps revolving around you as you dine is more than enough to distract you from any shortcomings. I didn't eat there. Just below the restaurant was a gift shop filled with lots of souvenirs from the movie. There was also a small visitors center with a film screening room that played scenes from the movie, repeating every 20 minutes or so. I caught a few minutes of that then stepped outside. More absolutely spectacular views greeted me from every direction. There was not a cloud in sight for hundreds of miles. So I returned down the mountain on more gondolas. At Mürren, I made a detour to visit the small (population ~100) town of Gimmelwald. I felt obliged to visit - because Rick Steves devoted a large section in my guidebook (Rick Steves's Best of Europe 2008) to this small village (if you could even call it that. Rick Steves had never led me wrong before, so I trusted his advice wholeheartedly. 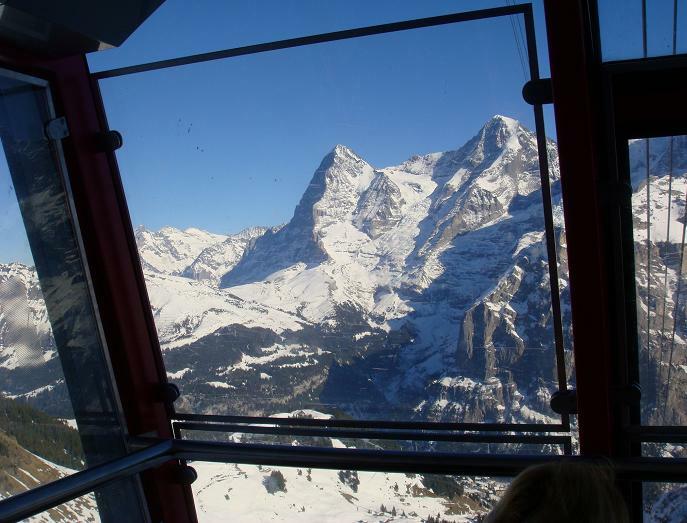 There were only a few people in the gondola with me, and when I got off in Gimmelwald, there were even fewer people in the town. I had simply walked into a collection of a dozen or so buildings, completely deserted and covered in snow! What a pathetic disappointment! I took a moment to read through Rick Steves's description of the town and what exactly he found so charming. Well, apparently he visited in the summer when the cows are brought up to graze in and around town - okay, that wouldn't be there for me. There was a fountain used to pump drinking water for the cows. I saw it - it was frozen. And it was just a fountain! Apparently one of the buildings was a hotel, but everything in the town looked to be closed, so I couldn't even tell. Rick Steves, I'm sorry to say that this time you failed me! Why, oh why?! Well, so much for Gimmelwald. I returned on the gondola to Mürren, where I walked through the town. It was covered in snow, but it's a much larger town and has several resort hotels, so there was at least some activity. I walked behind a guy cross-country skiing down the main street! 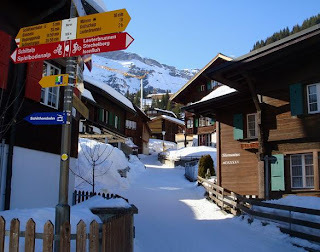 I made my way to the Bergbahn Lauterbrunnen–Mürren, a mountain railway that connected to one final gondola to take me back to Lauterbrunnen. 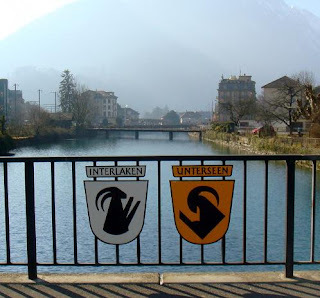 And I was soon back in Interlaken. I was rightfully exhausted as I returned into Interlaken in the late afternoon. I walked from the east train station to my hostel near the west, and the city seemed more hushed. It was Sunday, after all. I rested for a little bit at the hostel. The guys I was hanging out with all week were already gone, on their train back to Lugano. I wandered back into town on my own and had dinner at McDonald's. I know, chastise me as a hypocrite for extolling the virtues of traveling and eating local while practicing the inhumanity of supporting the number-one representative of globalization! But it's hard to argue with dinner costing less than $4. Homo economicus shone through! The two girls from UCSC had disappeared for the night - to a hospital perhaps? I never heard from them again. Their friend, Alex, returned with a new friend of his own. I also met the other Alex, from Taiwan, who simply left his job for six months to travel around the world. Very cool! After two exciting days and fun nights, I had a quieter night of rest for once. Well, mostly. 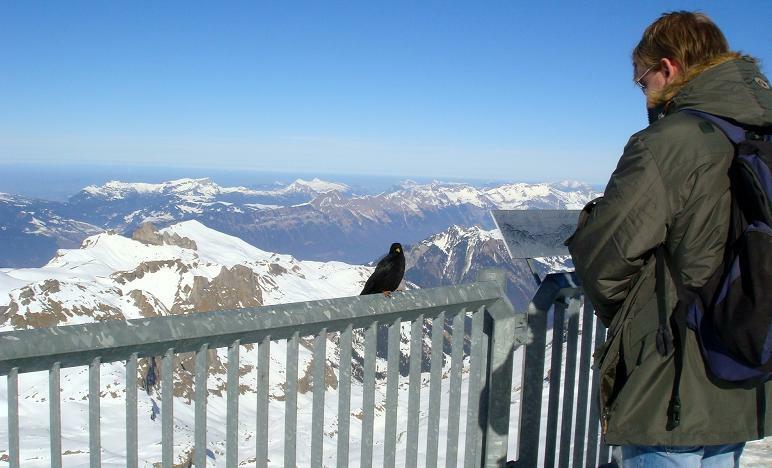 There was more of Switzerland to see!